State lawmakers have overwhelmingly approved an incentive package designed to lure Amazon to Arlington, sending legislation to Gov. Ralph Northam’s desk that will direct hundreds of millions of dollars in grant funds to the tech giant over the next 15 years. Virginia’s House of Delegates passed a bill on the matter by an 83-16 margin today (Monday), after the state Senate signed off on the legislation with a 35-5 vote last week. 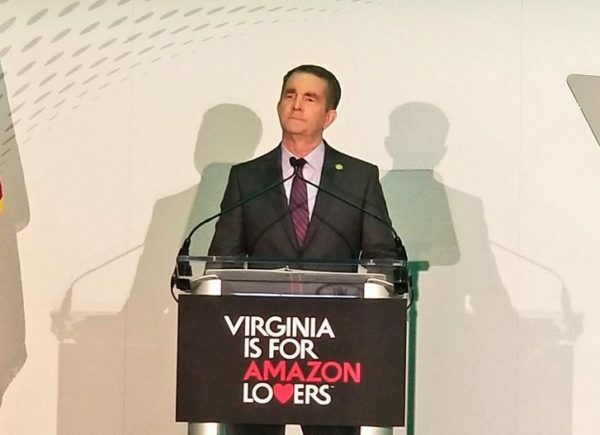 Northam will ultimately have the final say on the issue, but considering that his administration helped broker the deal with Jeff Bezos’ firm in the first place, it now seems a sure bet that the company has the state’s support for a massive expansion in Pentagon City and Crystal City. The legislation sets up a “Major Headquarters Workforce Grant Fund” to hand out the payments, designed to offset state taxes Amazon would incur should it set up a massive new headquarters in the county. In all, the bill would send $550 million to the tech giant between now and 2030, so long as the company delivers on its promise to bring 25,000 high-paying jobs to the area. If the company can come through with another 12,850 jobs after that, Amazon stands to earn another $200 million in incentives, for a total haul of $750 million attached to the project. Northam and his negotiators promised a variety of transportation improvements around the proposed headquarters in order to make Arlington seem especially attractive to the company, in addition to investments in tech education programs at state universities. But those measures will likely be included as part of the state budget, or funded through other state programs, leaving the incentive bills as the clearest chance for the General Assembly to have its say on Amazon’s arrival. “When it comes to Arlington and Alexandria, I believe this is exactly what they want,” said Del. S. Chris Jones (R-76th District), a member of a powerful panel of lawmakers who worked with Northam to hammer out Virginia’s offer to the company, during a brief floor debate today. While the incentive legislation never faced much in the way of serious opposition, it did attract dissenting votes from Republicans and Democrats alike. Six Democrats and 10 Republicans in the House opposed the bill, while all five state senators to vote against the measure were Republicans. Notably, Del. Alfonso Lopez (D-49th District) was the lone member of Arlington’s legislative delegation to vote against the bill. Part of the company’s headquarters will be based in his South Arlington district, and he’s already raised concerns about how Amazon will disrupt the area’s housing market. He also chose to send back campaign contributions from the tech giant, after Amazon shelled out cash to all of Arlington’s lawmakers and many other prominent state leaders. Experts across the region say that it’s no sure bet that Amazon will suddenly drive up all home prices and force renters out of the county, but they do believe it’s a distinct possibility that low- and middle-income people could feel a squeeze from the company’s arrival. And with Arlington and Alexandria committing to just limited affordable housing measures on top of the state’s efforts, some lawmakers do indeed see reason for skepticism. Others still, Republicans and Democrats alike, questioned the wisdom of handing over such large incentives to a company owned by the world’s richest man. But the potential of the deal to bring so many jobs to the region, with a corresponding flow of tax revenue to local governments, was too promising for many lawmakers to pass up. “We put together one of the best business deals I’ve ever seen in my 20 years of economic development experience,” said Del. Matthew James (D-80th District) during a committee hearing on the legislation last week. Like Jones, he helped negotiate the deal with Northam’s team. The House also acted today to combine two identical Amazon incentive bills into one before sending the legislation to Northam, which should remove the need for the Senate to consider a version of the bill to originate in the House. Once this year’s legislative session ends on Feb. 23, the governor will have a month to decide whether to sign or veto the bill. In the meantime, Arlington officials have yet to consider their own package of incentives attached to the deal, totaling about $23 million in grant funds over 15 years. The County Board plans to take that matter up no sooner than its Feb. 23 meeting, but some members have recently begun suggesting that they could push the issue into March instead.